FCCP seeks a society where marginalized communities have the POWER to make a difference on issues that impact their lives, a CULTURE OF PARTICIPATION that inspires their engagement, and an OPEN + EQUITABLE DEMOCRACY which offers meaningful opportunities to exercise their voice. FCCP members, leadership, and staff intend to increase our impact as a modern affinity group, ensuring every dollar counts in a time of threat to our democracy. To become, as FCCP co-chair Connie Malloy put it, “what the field needs right now,” we articulated a theory of impact that refines our goals and better defines our levers of change. Provide a framework for our programming, outreach, partnerships and staffing decisions. FCCP has worked from an implied theory of impact for many years, but our recent process makes it explicit and shared, drawing on the collective wisdom of our membership to evolve the framework. The graphic and narrative that follow are a second iteration, incorporating extensive feedback provided by members during the Summer of 2017. We see this second iteration as a stake in the ground that will lead to additional thought and reflection. In the Fall of 2017, FCCP is launching new programming that builds from this framework. We will share a mapping of our members’ investment in states and evaluate a role for FCCP in helping funders in specific states share information and coordinate their efforts. Please take our state funding survey to contribute your data and thinking to this project. Also, if your foundation is working on research or strategies that could help us interrogate, deepen understanding, or clarify concepts in the Theory of Impact framework that follows, please email Eric Marshall. FCCP works to transform our democracy into one that is representative and well-functioning, where all people are inspired to participate. We center our work on supporting marginalized communities, whose voices are most often left out of decision-making processes that affect their lives. Our members support these communities to build collective power and agency to overcome current and historical barriers to their participation. Democracy is an ideal — the real-world practice of which is always inadequate, and requires vigilant analysis and improvement. Democracy is our endless task toward greater inclusion, justice, and equality. To this end, and leveraging the risk capital and moral authority philanthropy uniquely holds, FCCP encourages experimentation and solutions that drive democracy towards openness and equity, and fuel a culture where people want to participate, knowing their participation matters. 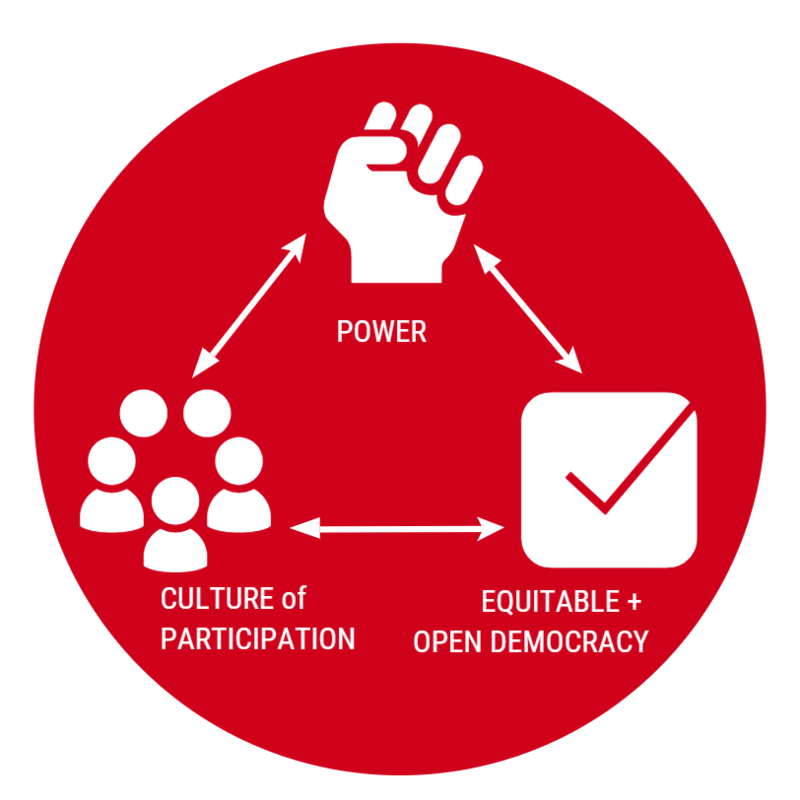 The three pillars of change we seek – community power, a culture of participation, and equitable open democracy – reinforce each other and set the conditions for a more just society. To deepen a core pillar in our theory of impact, FCCP facilitated a 12-member funder-field team to dig into what we mean by building power and recommendations for how funders can best support communities to build and wield power. The team’s recommendations can be downloaded from our Power Impact Team page. FCCP believes the non-partisan organizations fighting for political and cultural power, a truly representative government, and a culture of participation and fairness present our best chance for a just, equitable, and strong America. Funders in our network employ a range of strategies individually, but collectively we focus on the following primary strategies. Organized communities have more power than do individuals on their own. 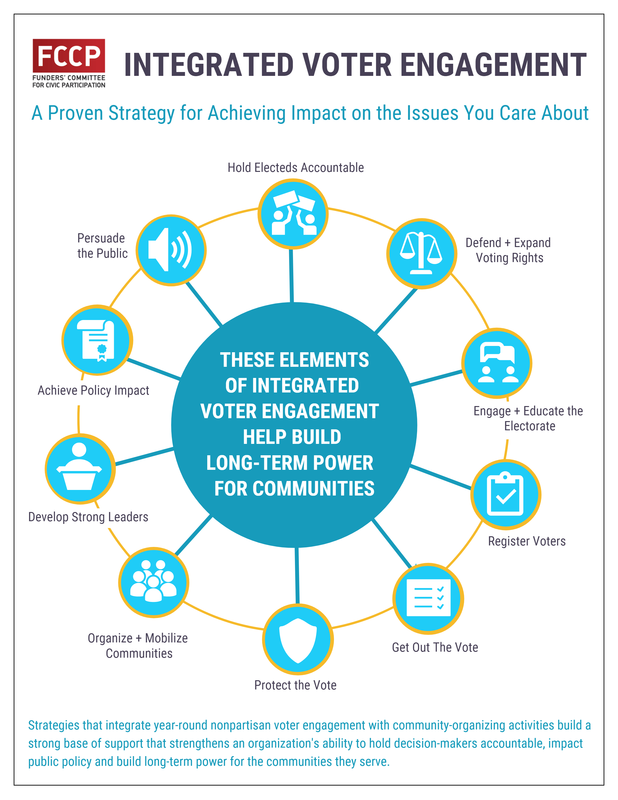 The Integrated Voter Engagement (IVE) wheel of change shows the multiple tools employed by non-partisan groups to build power for communities that can ultimately move the needle on public policy. Note that no one organization is likely to optimally practice all of these elements. FCCP is unique in focusing on how a set of organizations come together to collectively cover the range of IVE. Because the work of organizing community is necessarily local, FCCP hosts the State Infrastructure Funders Table, which builds collective understanding about effective ways to fund IVE in states. SIFT also works to bring a local and state lens to other FCCP programming. The Research & Experimentation Working Group organizes itself around IVE as well, seeking the most comprehensive and accurate research on which tactics work to inform funding and field strategies. FCCP members coined the term “Integrated Voter Engagement” to help funders and organizers recognize voting (registration, reform, rights, protection, engagement, education, mobilization) as a valuable tactic to integrate into traditional community organizing. FCCP views electoral strategies as a set of essential tools that help communities leverage power on governance structures. Other interlinked strategies reflected in the IVE wheel of change (right) include advocacy, leadership development, advancing persuasive stories/narratives, and organizing both voting and non-voting communities. All of these components are paths to building social and cultural power and changing public policy. FCCP members support non-partisan groups that are a counterweight to the influence of money in politics, and which fight for electoral and governance systems that give everyone a fair shot at participation. Our Money in Politics Working Group is a hub for grantmakers seeking to better develop the money-in-politics field, explore how it intersects with civic engagement issues and groups, and discuss strategies being advanced by advocates. Recognizing that accurate census data are essential for the fair distribution of political representation and allocation of government resources, the Funders Census Initiative organizes broad philanthropic support for a fair and accurate count, particularly among marginalized communities. 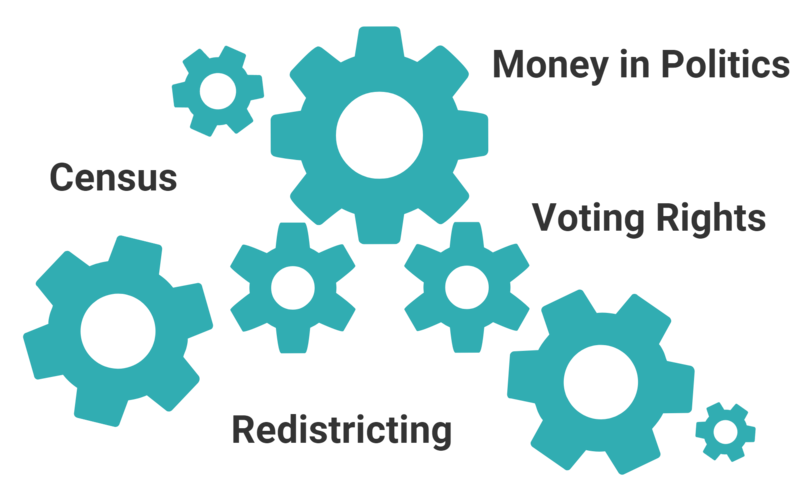 A through-line in our programming consistently highlights the essential work of grantees fighting for voting rights, election administration, redistricting, and other reforms. When these groups are resourced to execute their missions, our democracy will be more equitable and structurally sound. From the Supreme Court to the Federal Election Commission to state redistricting commissions, national and state institutions and rights enshrined in our founding documents must be protected and strengthened to bring our democracy closer to its ideal. Members fund organizations fighting for a fair and independent judiciary, an open and secure internet, a Department of Justice that stands up for marginalized communities, and much more. In volatile political times, even such foundational concepts as the right to protest may be at risk. 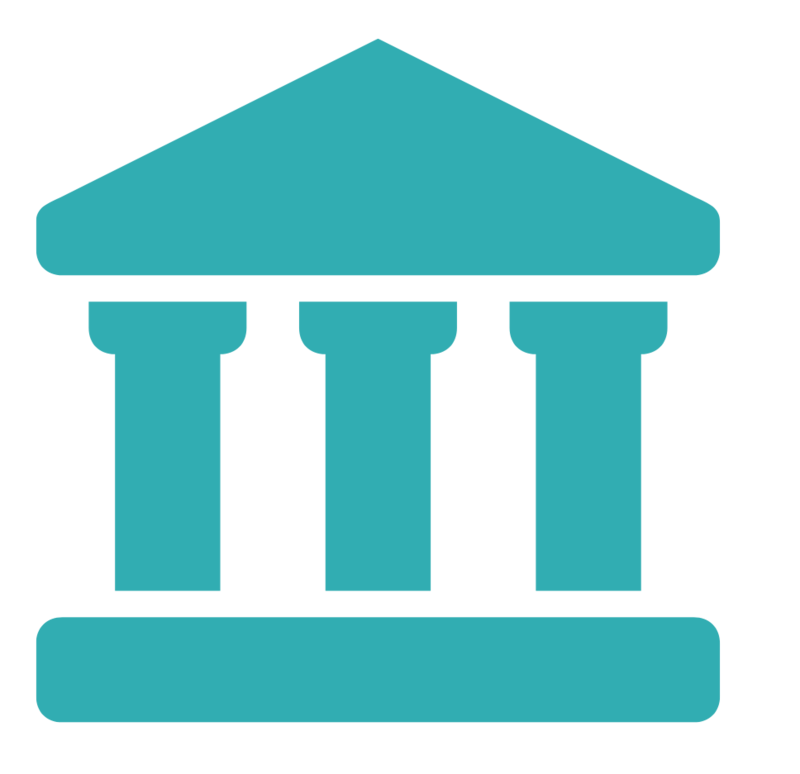 FCCP taps the wisdom of its members to keep the network informed about the threats to critical institutions and the opportunities to create better democratic systems. Funders are at least once removed from the change they seek in the world. 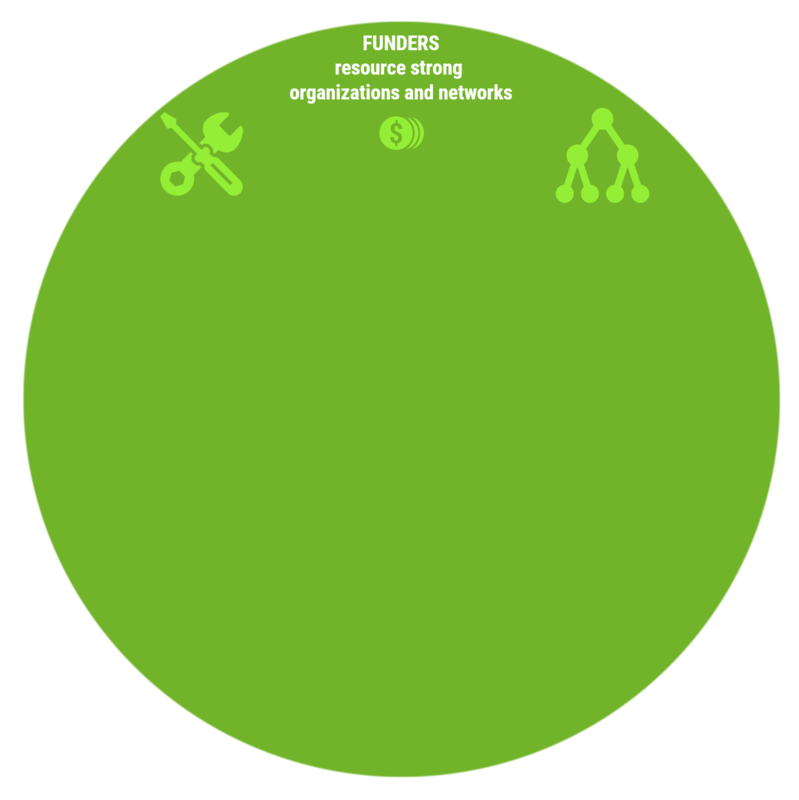 Funders’ area of influence is in supporting the field of changemaking organizations to have the capacity required to execute their missions. Our foundation members provide and organize substantial and sustained resources to structural democracy and civic engagement groups. Many provide other capacities that include technical assistance, strategy development, network resources, and leadership development. 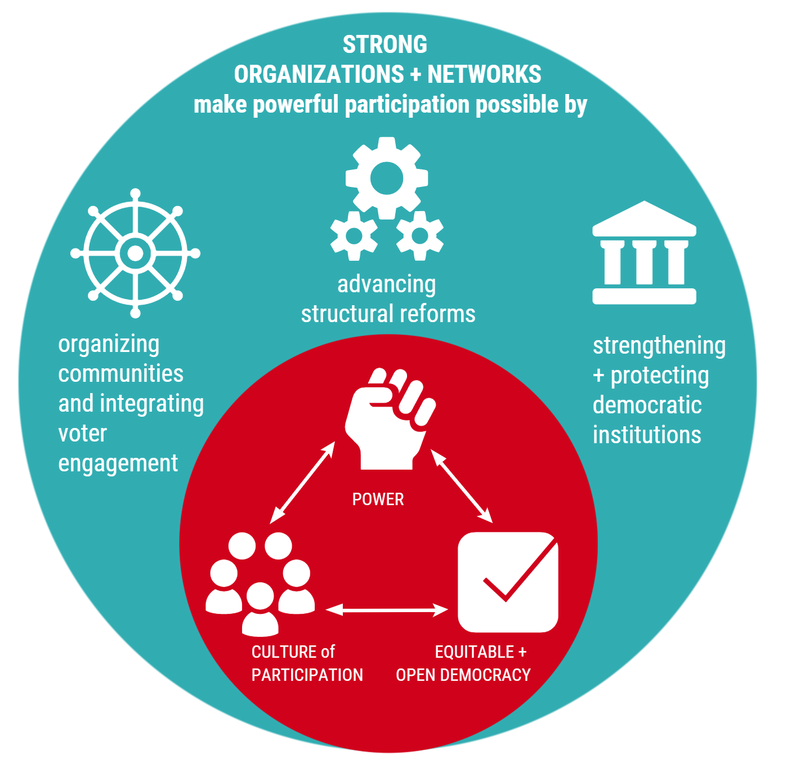 Note: while our network focuses solely on non-partisan democracy and engagement funders, we work in alignment with and highlight the importance of other strategies and sectors required to make change. Raising up democracy and engagement in philanthropic circles, including nationwide presentations of our Civic Engagement Matters Toolkit + Curriculum. Bringing issue funders into the fold, by showing the importance of democratic systems, organizing, and voting in moving the needle on any issue. For example, FCCP’s Election Series is presented in partnership with nine other funder affinity groups. Reaching out to and effectively onboarding new funders into our network. Builds relationships that lead to coordination and collaboration. Designing space for grantmakers to network, collaborate, and find partners and peer support. Staffing working groups in areas of particular interest to subsets of our membership. Provides a dynamic learning community to inform funding strategy. FCCP provides a spectrum of programming from education to strategy development. Our members lead and shepherd most programming, allowing funders to draw from the collective wisdom of a growing and diverse network. While high quality educational and informational programming is core to FCCP’s approach, we are increasingly designing space for members to go deeper and grapple collectively with the big, hard questions that face our democracy in a time of profound cultural, economic and political transition. FCCP serves as a repository and gatherer of research on what works in the areas outlined by our theory of impact. We stop short of credentialing what strategy is “right”, but seek the best answers available, asking members to loop staff into definitional conversations and research that proves the case. By collecting and mapping various grantmaker strategies, FCCP makes them visible to a broader audience, sometimes to inspire coordination or co-learning. 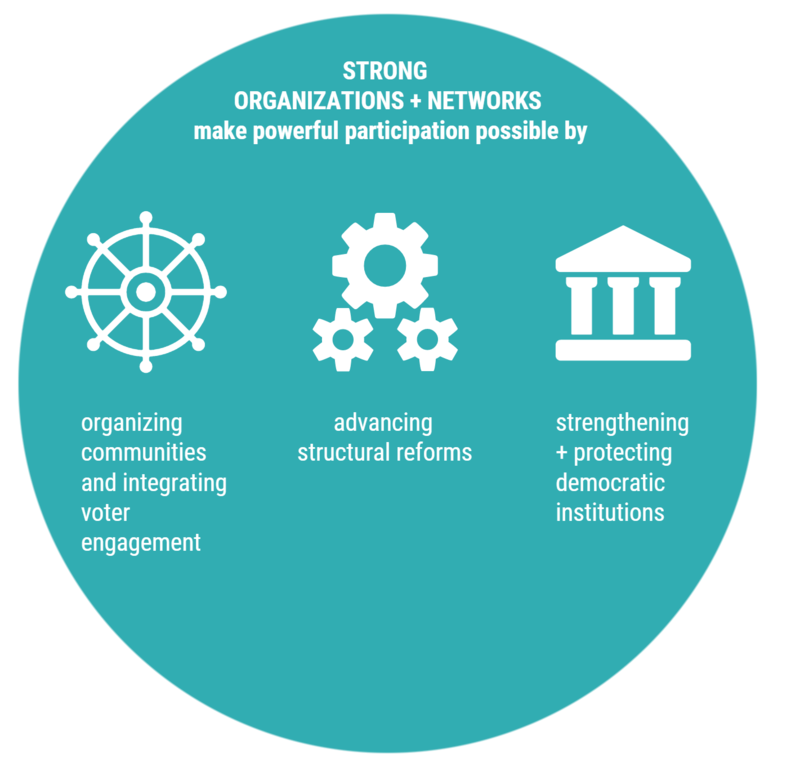 FCCP enrolls field organizations to inform and strategize with our network, and communicate trends affecting grantees in the democracy and civic engagement sectors. An equity lens ensures our work stays grounded in the moral imperative to support and empower marginalized communities. An innovation lens helps us integrate new ideas and activities in the rapidly evolving world of civic engagement, technology, and structural reforms. A long-term lens centers strategies that move past boom/bust funding patterns and see the value of rooted community infrastructure. Finally, but importantly, FCCP is not only a group of institutions and funds, but also a community of dedicated people who express great value in building their networks and capacities. FCCP brings value by creating space where civic engagement champions hone their strategies and analysis, and ultimately advance collective goals in the broader philanthropic field. Democracy is an ideal — the real-world practice of which is always inadequate, and requires vigilant analysis and improvement. 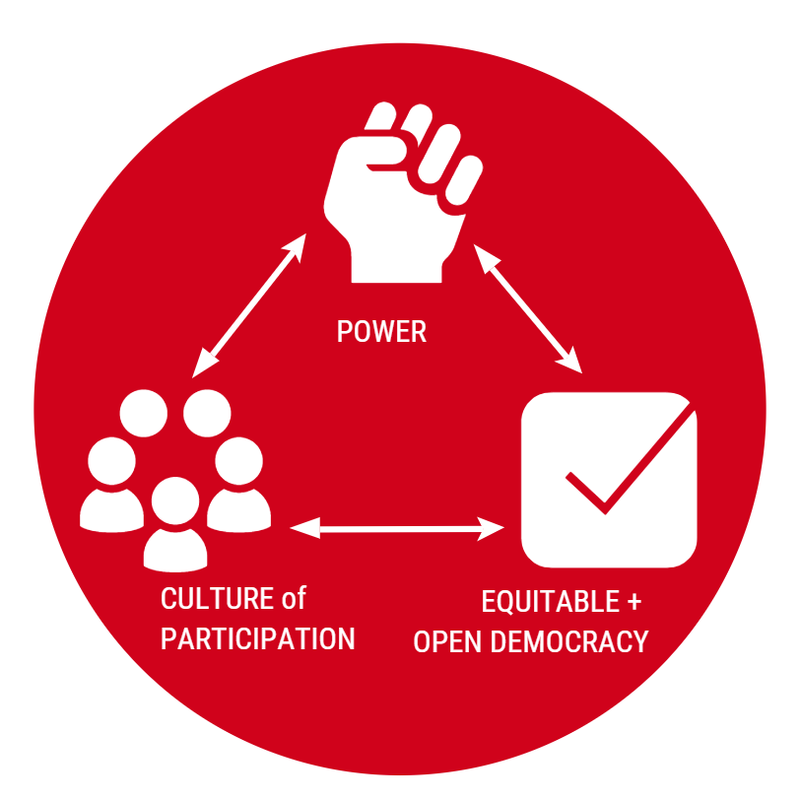 FCCP believes that our democracy will bring about greater inclusion, justice, and equality when communities left out of decision-making have power and agency, when our democratic structures and institutions are sound, and when our culture fuels participation. 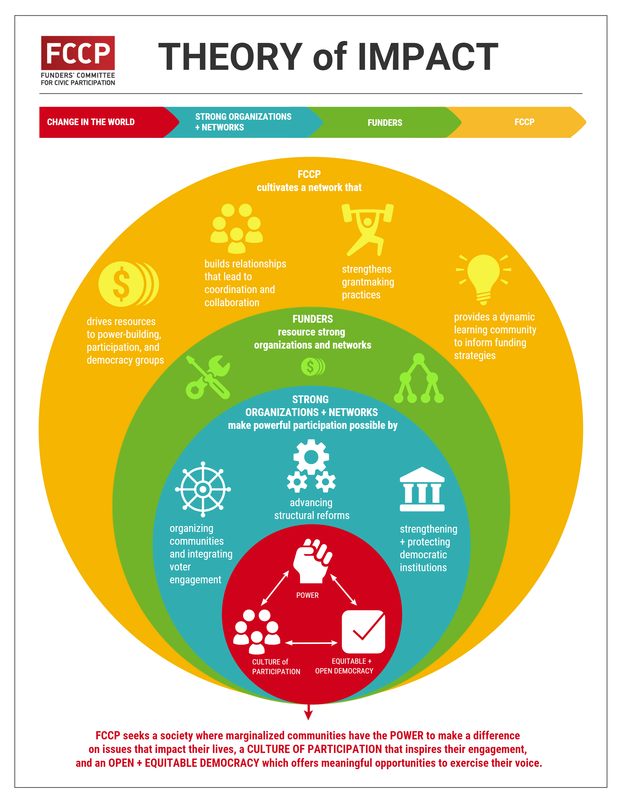 Organizations and networks are key to achieving these aspirations, and our philanthropic members best support their grantees when they learn and strategize collectively. FCCP’s task is to use all of our resources to help our members most effectively strengthen and sustain those fighting for a more perfect democracy.